Highlands Ranch is identified as a census-designated place (CDP) in Douglas County. It is considered an unincorporated community. The area is primarily residential with shared municipal services with the adjacent City of Littleton. Highlands Ranch’s first homes were built in 1981, near South Broadway Blvd. The population of Highlands Ranch grew greatly over the ensuing years to 96,713 by 2010. The community covers a total region of 23.5 square miles. County Line Road and the cities of Littleton and Centennial border Highlands Ranch are its borders to the north; Quebec Street, the City of Lone Tree and Acres Green CDP borders the community towards the east; and Santa Fe Drive and Chatfield State Park are its borders towards the west. 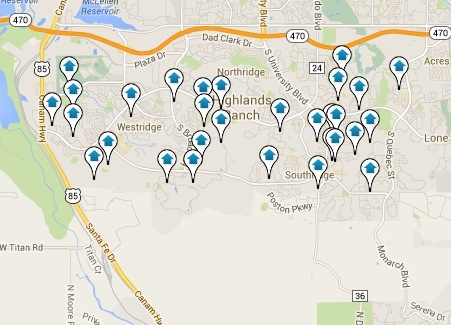 Highlands Ranch distinguishes itself by its close-knit neighborhoods. Homes in the area are large; the median home size is 2,035 square feet. Approximately 66.3% of residents are homeowners and single family homes represent 84.6% of the residential property in the community. Highlands Ranch home values have gone up 5.6% over the past year. The median home value locally is worth $325,800. The median list price per square foot here is $183, the Denver Metro average is $175. The median cost of houses currently listed in the area is $362,000 while the median cost of homes that sold here is $335,200. Condominiums are also available in the area. These residential properties represent 10.9% of the living spaces in town. What many people find satisfying about Highlands Ranch, is the community atmosphere and the warm friendships that endure.